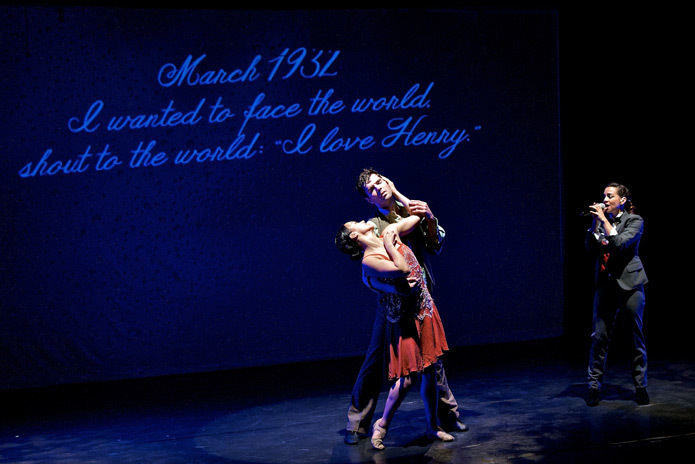 Dancers representing Anaïs Nin and Henry Miller perform as “Eternal Anaïs” sings on the right. One way to understand this hybrid of rock songwriting, contemporary dance, and digital projections is as an offering to its subject, a kind of posthumous tribute to Anaïs Nin that exalts not only her art but also her sensuous, troublesome, deeply yearning character. Nin made complex drama of her multiple lives, and cocreators Cindy Shapiro and Janet Roston are to be congratulated for having gathered all the fragments of her kaleidoscopic existence into a form that fits them. Of course, there’s no way of knowing this, but I feel certain that Nin would have liked Anaïs, A Dance Opera. First off, she would have approved of splitting her character in two and giving the part of Eternal Anaïs, the vocalist, to the passionate and talented singer Holly Sedillos. She also would have enjoyed the spirited performance of “mobile Anaïs” by the nonstop dynamo dancer Kate Coleman. Both performances tapped in to something essential about the woman they portrayed. For Sedillos, it was the compulsive nature of Nin’s affair with language, the drive that brought her back to writing in her diary day after day for decades. For Coleman, it was Nin’s tendency to size up other bodies as opportunities and to tease, embrace, straddle, and even nurture those chances as they came her way. Seldom has an artist’s personal life seemed so suited to expression in choreography. The splendid ensemble of dancers executed Roston’s moves with clarity and vigor, and Joe LaRue’s projection design gave the whole thing a polished coherence that would be the envy of any professional theater in the country.